My husband, David, recently took a business trip to Europe. I’ve always dreamed of going to Europe and I haven’t had the chance yet. As consolation, David promised to bring me back a truffle from France. He visited family friends in Paris who have a second home in the country. At the farm, they have a tree that frequently harbors black truffles buried in the dirt underneath. They explained that this year had not a good year for finding truffles so they gave him truffles that they had canned in a previous year. 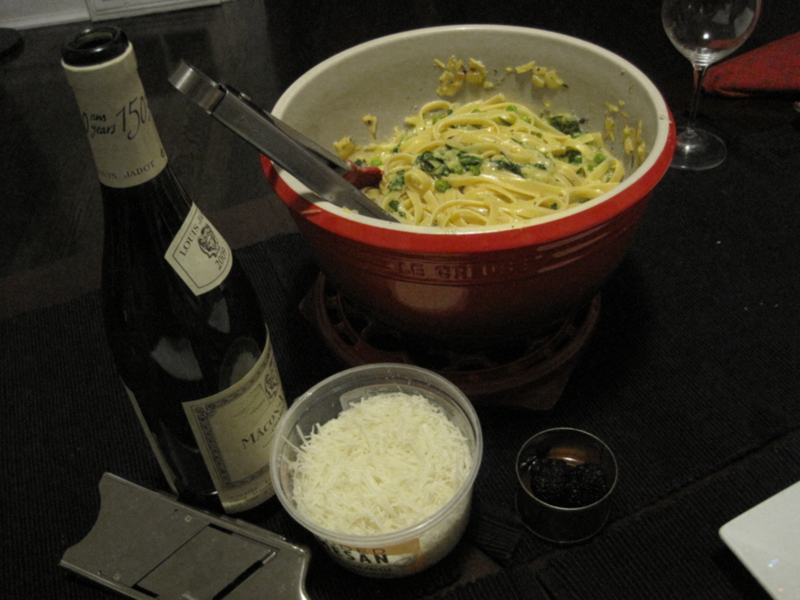 I wanted to make a simple meal that would showcase but not overwhelm the truffle. 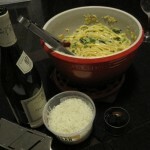 So, I decided to make a simple Carbonara with linguine, peas, basil, parsley and an egg, white wine and parmesan sauce. 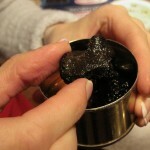 We opened the little can and were surprised to find four tiny black truffles! They were round and spongy with a bumpy texture. I was a little disappointed that they were not as pungent as I expected. But maybe I am just used to white truffle oil that is usually enhanced with garlic. Or maybe it was because the truffles were canned, not fresh. No matter, a few shavings of truffle on the pasta was still a special treat. 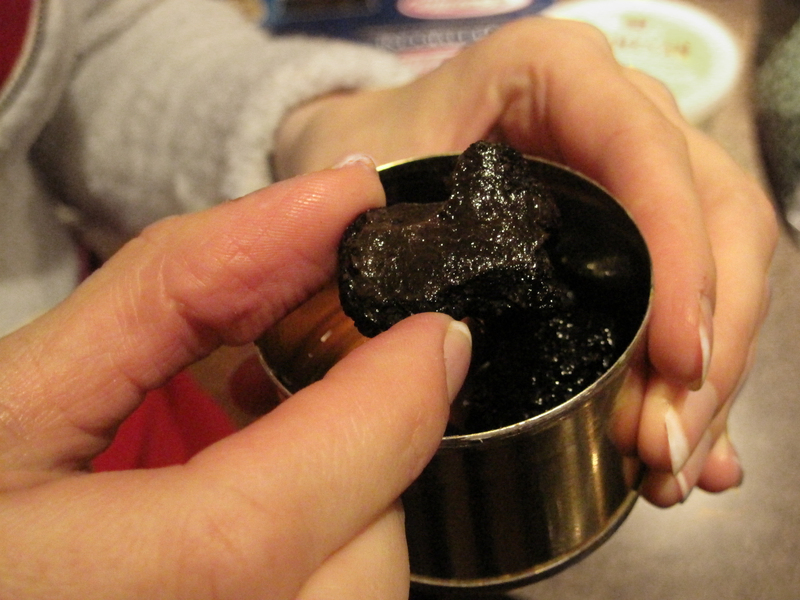 I would love to go truffle hunting someday when I go to Europe. Have you been lucky enough to find your own truffle? 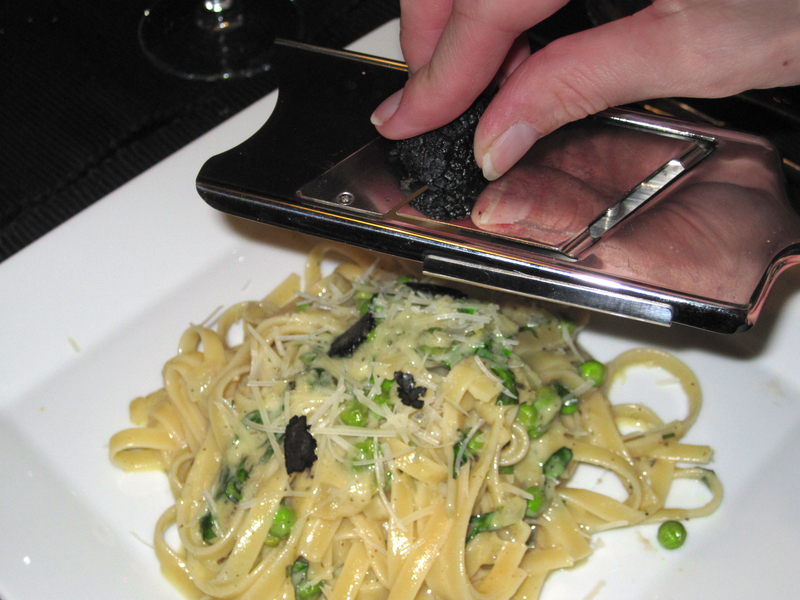 Have you had a great dish in a restaurant enhanced by truffles? Does the smell of fresh truffle blow your mind? I would love to hear about your truffle experiences. I had the good fortune to visit Italy the first part of November several years ago. Truffle season! My most memorial dinner was at a little trattoria in Florence where there was a piece of paper on the wall saying “Tartufo”. I asked the owner about it and he was pleased to offer a dish similar to the one you describe, Lindsay. His wife cooked and I swear she looked like a young Sophia Loren. When our dinner was ready, the woman comes sweeping out of the kitchen to set our plates in front of us with a flourish. Her husband opened a little plastic container and let me get a whiff of the truffles. Heavenly. Then he used a tool to shave pieces of it on to the top of my simple carbonara. The whole evening was an experience I will never forget.